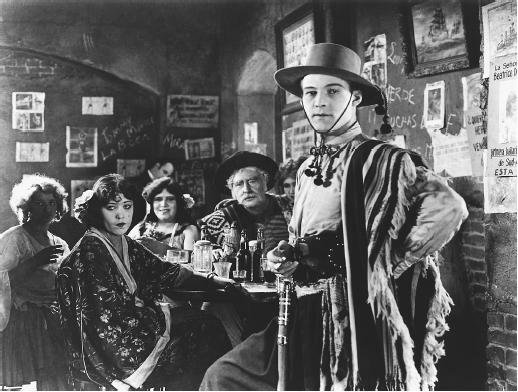 Producer: Rex Ingram; scenario: June Mathis, from the novel Los cuatros jinetes del Apocalipsis by Vicente Blasco-Ibáñez; art titles: Jack W. Robson; photography: John F. Seitz; editors: Grant Whytock and June Mathis; art directors: Walter Mayo and Curt Rehfeld; music for accompanying film: Louis F. Gottschalk; technical assistants: Amos Myers and Joseph Calder; makeup: Jean Hersholt. Georgia Woodthorpe ( Lodgekeeper's wife ); Kathleen Key ( Georgette ); Wallace Beery ( Lieutenant-Colonel von Richthoffen ); Jacques D'Auray ( Captain d'Aubrey ); Curt Rehfeld ( Major Blumhardt ); Harry Northrup ( The Count ); Claire De Lorez ( Mademoiselle Lucette, the model ); Bull Montana ( French butler ); Isabelle Keith ( German woman ); Jacques Lanoe ( Her husband ); Noble Johnson ( Conquest ); Minnehaha ( Old nurse ); Arthur Hoyt ( Lieutenant Schnitz ); Beatrice Dominquez ( Dancer ); also featuring Ramon Samaniegos (later Novarro) in small role. Milne, Peter, Motion Picture Directing: The Facts and Theories of the Newest Art , New York, 1922. Jacobs, Lewis, The Rise of the American Film: A Critical History , revised edition, New York, 1968. Predal, René, Rex Ingram , Paris, 1970. Everson, William K., American Silent Film , New York, 1978. O'Leary, Liam, Rex Ingram, Master of the Silent Cinema , Dublin, 1980; updated revision 1994. Variety (New York), 18 February 1921. New York Times , 7 March 1921. Robinson, J., interview with Ingram in Photoplay (New York), August 1921. Geltzer, George, "Hollywood's Handsomest Director," in Films in Review (New York), May 1952. McPherson, Mervyn, in Films and Filming (London), May 1956. O'Leary, Liam, "Rex Ingram and the Nice Studios," in Cinema Studies (England), December 1961. Bodeen, DeWitt, "Rex Ingram and Alice Terry," in Films in Review (New York), February and March 1975. Graham, Ian, "Rex Ingram: A Seminal Influence, Unfairly Obscured," in American Cinematographer (Hollywood), vol. 74, no. 4, April 1993. Cherchi Usai, P., "Elogio dell'istinto," in Segnocinema (Vicenza), no. 61, May/June 1993. Bourget, J.-L., "Entre Stroheim et David Lean: le roi Ingram," in Positif (Paris), no. 404, October 1994.
" Les quatre cavaliers de l'apocalypse ," in Séquences (Haute-Ville), no. 177, March-April 1995. When screenwriter June Mathis campaigned among the executives of the then none-too-sound Metro Film Company to have Blasco Ibáñez's best-selling novel The Four Horsemen of the Apocalypse transferred to the screen, she was on shaky ground. The war had been over for two years, there had been a surfeit of war films, and people wanted to forget. She succeeded, however, and she also had the intelligence to recognize the talents of two young men—the director, Rex Ingram, and the actor, Rudolph Valentino. In production the film gathered momentum; there was an air of expectation. Ingram, who had hitherto produced distinguished work without achieving full recognition, had a talent for moulding actors, and the young and largely inexperienced Valentino, lithe and graceful as a dancer, with style and charm and a touch of the devil, proved ideal material for the screen. Ingram, who had come from an Irish rectory and an artistic training at the Yale School of Fine Arts, had inherited his father's capacity for study and research. He had never been to France, knew nothing of European culture, and yet he succeeded in creating in Hollywood the atmosphere of Paris in wartime and the tragedy of the destruction that had ravaged Europe. The Four Horsemen was an immediate sensation, comparable in its success only to the major films of D. W. Griffith some years earlier. In all the large cities it was sumptuously presented with large orchestras and backstage sound effects for the battle scenes. Its story had all the ingredients for success: a dazzling gigolo hero and a tragic story of frustrated illicit love. It ranged from the pampas of South America and the glittering world of Paris, to the horrors of war and the invasion of a French village by the Germans. Pervading everything was the anti-war theme and the mystical element of the four terrible horsemen. It was also anti-German to the point of caricature: it was banned in Germany and indeed withdrawn from circulation many years later when a campaign was launched to suppress films promoting hatred between nations. But for years it was the major box-office attraction, and was revived on the death of Valentino. Indeed, it is now remembered more for its star than for the genuine achievement of Ingram himself. Yet today's viewers, even those whose main interest is in nostalgia for Valentino, will be struck by the excellence of the film itself. With the help of his constant collaborator, the cameraman John Seitz, Ingram infused the film with great visual beauty, a sensitivity to light and shade, and an unusual feeling for composition. The effect of the film was to shore up the finances of the shaky Metro company, recently taken over by Marcus Loew. It established Valentino as a star, and it established Ingram as a major director who henceforth had carte blanche and full control of his films. A "Rex Ingram Production" thereafter carried as much weight as the star's billing, and indeed Ingram can be said to have set an aesthetic standard for the screen image.